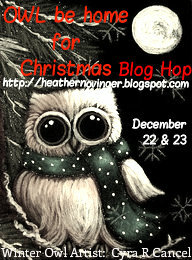 I want to thank each and everyone that hopped along with us for the Owl Be Home for Christmas Blog Hop! You all left us such sweet comments! We appreciate it so very much! I want to thank all of my talented friends that were in my hop for being a part of it, too! THANK YOU!!!! You all did a fantastic job!! So today is the day I am picking a winner for the grand prize! Are you ready? You have 7 days to contact me or I will pick another winner. Your hop was so much fun. I wish I had taken the time to do one of yours sooner. Sometimes life gets in the way but I am going to try to slow down and join the fun here, more often. I followed all your directions and am following all the hoppers now and so very glad to be doing so. Congratulations, Ann!!! Please contact me at the email on my left sidebar and I will send you your prize! 2013 will be here soon and I hope the year is great for everyone! Owl be Home for Christmas Blog Hop!! Hello Friends! 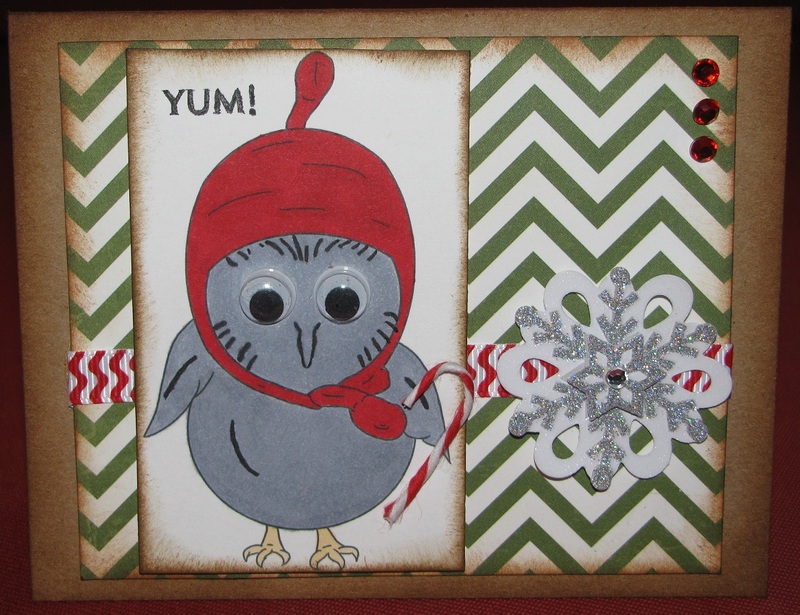 Welcome to the Owl Be Home For Christmas Blog Hop!! We are so happy you are here! This is the first stop in the hop today! 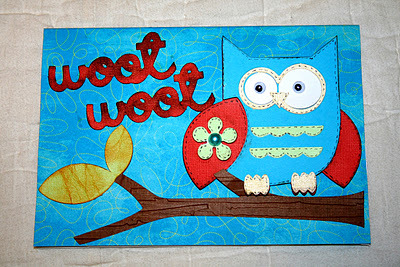 We have all made some super cute owl themed projects to share with you! You will not only get some inspiration~ but you could win prizes, too! I am offering ONE lucky hopper a really fun prize. You must FOLLOW and COMMENT at all of the stops to have a chance to win the Grand Prize! There will be lots of other candy offered along the way! Please be sure to tell me you followed all of the rules at the last stop in the hop at our Pinque Peacock Blog! I will be choosing a winner from there! Some pretty Webster's Pages goodness, Some TH Distress Embossing Powder, and some Martha Stewart tinsel. I will draw a winner right after Christmas using Random.org. I started with a canvas and covered it with papers. The little tree and all of its layers were cut from the Winter Frolic Cricut cartridge at 7 inches. 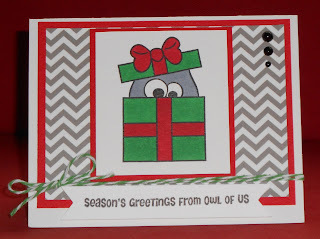 The owl stamps and sentiment are all by Hero Arts and the set is called Owl Christmas. I colored all of the 7 owls with my Copic markers. (Each owl represents someone in my family. Yes, I am blessed with 5 children!! :) ) I am going to hang this up in my living room. My 2 projects are cards. I just love these stamps!! My SFF Jessica got this set for me for my birthday and I have used them tons! The stamps are by The Craft's Meow. I colored in the images with my Copic markers. 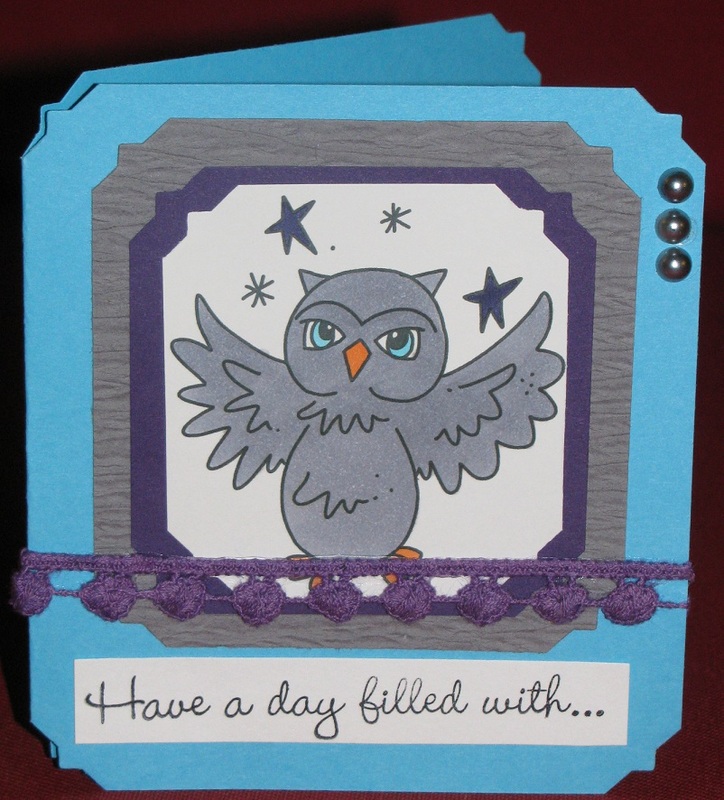 I love to add twine or my favorite 3 Girl JAM Crinkle Ribbon to my cards! My last creation is a small shadowbox I found new in the box at Goodwill for just $1! 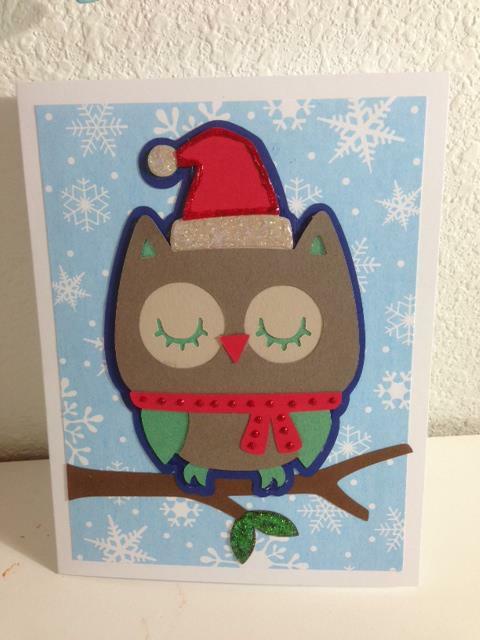 The cute little owl was cut using the Create a Critter 2 Cricut cartridge. The little hat I just hand cut with my Cutterbee scissors. Look at that cute little bow on the owl's hat! I made that using the 3 Girl JAM Bow Maker. You can make perfect bows every time!! The crinkle ribbon is also by 3 Girl JAM in Ice Blue. Did you notice that cute polka dot button on top of the washi tape strips?That was made by us over at Pinque Peacock. I love how it matches my little owl. That's all of my projects today. Thank you SO very much for taking the time to hop! I wish want to wish you all a Merry Christmas and a wonderful holiday season! Next you will head over to my sweet friend Teresa's Blog!! Here is the full, amazing line up in case you get lost along the way! Hello crafty friends! I hope all of you are having a great week! Today I have a card to share and I wanted to remind you all about my "Owl Be Home for Christmas Blog Hop" that is coming up this weekend!!! Please save the date and join us! My talented friends are amazing! There is sure to be awesome projects and great prizes, too! Here's a couple pictures of the grand prize! 7 Darice embossing folders, 8 small See D's stamp sets, and a beautiful large stamp set, too! Some beautiful Webster's Pages goodies, Martha Stewart glitter, and some embossing powder! I sure hope you will come by and join us for the hop! It will start right here on my blog!! I know there is going to be more prizes along the way offered by my friends! I just love that stamp that Jessica gave me for my Birthday by the Craft's Meow! The patterned chevron paper is by Simple Stories. I used Copic's to color in the image and added some cute green twine. Welcome to the Shrooms and Blooms Blog Hop! If you arrived here from Jenn's Blog, then you are on the right track! If you just stopped by and would like to start at the beginning, please go back to Jenn's Blog. For my first project, I made a quick little card. 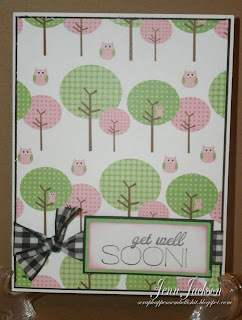 I started off with Kraft cardstock and then used some patterned papers from the Bo Bunny Apple Cider collection. I stamped right on a printed paper, then colored in parts of the image with Copic markers. I inked all of the edges with Vinatge Photo Distress Ink then added some little hearts and twine and voila..it's done. The stamp is a Itty Bitty by Unity that my friend Jessica gave. Thanks, Jess! Here's my next project that I made to share. For this project I started with a 35 cent wood frame that I picked up at Goodwill. I painted it with acrylic paint and then glitter blasted it with Krylon Glitter Blast Spray Paint. I used the Paisley Cricut cartridge to cut the mushroom and "totally". The little flowers are made from felt and were in my stash. The sentiment stamp is by K. Andrew Design from the set "Owly Hoo". I pop dotted the butterfly for extra dimension. Thank you so much for hopping with us today! 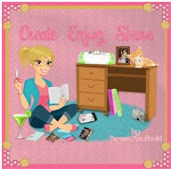 I know you will get lots of inspiration from this list of talented crafters! Next, you will head over to Angela's blog. Hi friends! Welcome to the Christmas Inspirations Blog Hop!! If you just came to visit from your dashboard, please head over to the 3 Girl JAM blog to start at the beginning! 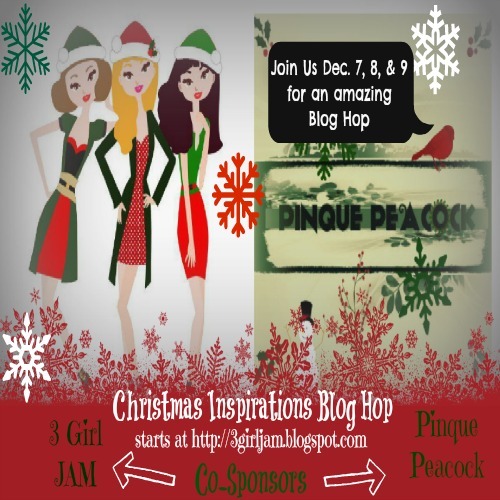 3 Girl JAM and Pinque Peacock are joining crafty hands and co-sponsoring a wonderfully inspiring Christmas Blog Hop. Your senses will be delighted and there will be some amazing products used from both the 3 Girl JAM and Pinque Peacock shops. Please grab a cup of cocoa, coffee, or tea and JOIN US the hop will be open from today, December 7th through December 9th. There will be tons of great prizes up for grabs!! You are sure to be in the Crafty Christmas Spirit as you Hop Along. 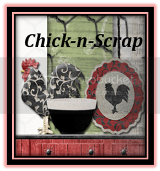 After you are done Hopping, you will have the opportunity to link up your very own projects for the December Christmas Challenge at the 3 Girl JAM Challenge Blog for even more chances to win some goodies!!! The Challenge runs from today, Dec. 7th until Dec. 27th. 30% off all items in our store at www.3girljam.com! For this card I used 3 Girl JAM Crinkle Ribbon in Holly Berry, Pinque Peacock Fabric Covered Button, stamp by Unity, EK Success tree punch, and some pretty patterned papers. I fussy cut the little snow people out of the patterned paper and hand cut a heart out of fabric to add to the button. For this card I used 3 Girl JAM Crinkle Ribbon in Aqua Splash, a tiny Pinque Peacock flower, Unity stamps, patterned papers, and some pretty orange square jewels. I just love that little penguin!! For this card I used a large Pinque Peacock Fabric Covered Button, 3 Girl JAM Crinkle Ribbon in Aqua Splash and Holly Berry, patterned papers, Kraft cardstock, Stickles, and Unity Stamps. (Thanks, Jessica, for letting me craft with you and use your Unity stamps and cute papers!!) I am entering this card in the "SNOW" challenge # 137 over at Craft Your Passion Challenge Blog. For my last project, I had picked up a wooden frame from Goodwill for 35 cents (a while back) and I painted it red. Then I sprayed it with silver glitter spray paint. I then covered the board with 3 Girl JAM burlap. I added lots of buttons with hot glue and used a couple of the Christmas Flair buttons by 3 Girl JAM. I just love them!! I used the 3 Girl JAM bow maker to make the tiny crinkle ribbon bow (in Mistletoe) that I added to the top. The pretty red flower is by us at Pinque Peacock. I added a few other embellishments and voila..my button art was done! This was so much fun to make! I hope you like my projects today! I am so happy you stopped by! I hope you are getting in the Christmas crafty spirit! Next you will head over to the talented Abby's Blog! Have a great day and a fabulous weekend!!! This morning, I came up with the idea to make this cute paper clip using a 3 Girl JAM Flair button and Crinkle Ribbon. Wouldn't it look cute on a card, a Smash Book, or even a layout?? I used the 3 Girl JAM Bow Maker to make the cute little bow. It really makes bows easy! 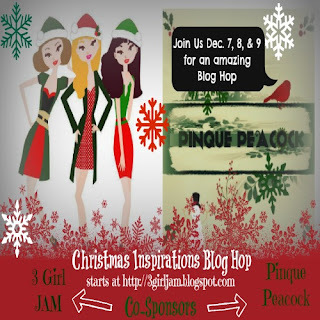 This weekend 3 3 Girl JAM and Pinque Peacock are joining hands for the Christmas Inspirations Blog Hop! I am so very excited for this! Please be sure to join us!!! Thanks so much for stopping by today! I hope you have a great week!! This card came together really quick. 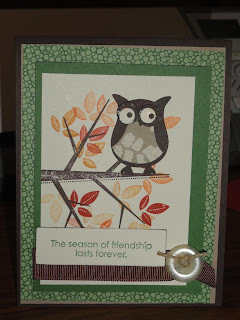 I love this owl stamp..so cute! I hope you like my card today. I also hope you all have a great weekend! Thanks for stopping by! For this card I used the Joys of the Season Cricut cartridge.I cut the card out at 5 1/4 inches. I added some green glitter paper behind and added stickles on the stocking top and the white border strip. The sentiment is a rub on. For this card I used the Gingerbread Cricut cartridge. I cut the stocking out at 3 inches. The papers are all by Echo Park from the Very Merry Christmas line. For this card I used the Word Collage Cricut cartridge. I cut the "collage" out at 4 1/2 inches. I inked the edges with Vinatge Photo distress ink. For my last project I used the Plantin Schoolbook Cricut cartridge. I cut the little bag out at 4 inches and the stars at 1/4 and 3/4 inches. The stamp is by CTMH. Just wanted to share a photo of all of my kiddos at Bass Pro Shops in Springfield Missouri. Aren't they sweet? I am so blessed!! Hope you like my quick projects today! Thanks so much for stopping by! Please be sure to leave me a comment so I know you were here! Here is the card I made to share with you all this week. Isn't that image cute? It's called Chilly Owl. Snowflake by K & Co. Thank you so much for stopping by to visit today! I hope you have a great week! Please head over to Craft Your Passion to see what the talented design team has created and enter this fun challenge! The image that I chose to work with is called My Pillow! Here is my card that I made to share with you. After coloring the image, the rest of my card came together quickly. I hope you like it! Please be sure to head over to Craft Your Passion Challenge Blog to see what the CYP design team made and enter in the fun challenge!! Thanks so much for stopping by!! Good morning, crafty friends! It's Saturday! Hoot! Hoot! I hope you have something fun planned for today. I forgot to pick a winner for my Owl Showcase earlier this week so I am here to do that now. Congratulations to you!! Thank you, Chriss for stopping by the Owl showcase and visiting my friends' blogs! Please get in touch with me so I can get your prize sent out to you! "Owl Made by my Friends" Showcase & GIVEAWAY! Hello! 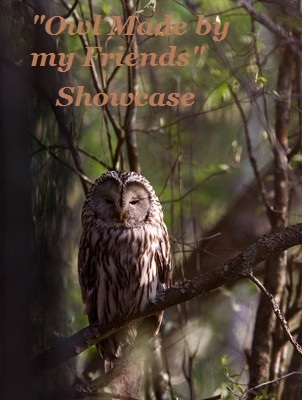 Welcome to the "Owl Made by my Friends" Showcase today. As you all know, I love owls. I have my Owl hops every season and have wonderful friends that join in. I thought it would be fun to showcase some of my friends' owl creations in between my hops. I plan on doing this every month so if you'd like to be showcased the next time, please get in touch with me on Facebook or by the email address on the sidebar on the left. Thanks so much to my sweet friends that made projects to share today! This is not a hop per say but it's going to kind of work like that. ONE of my blog followers that visits each of my friends' blogs to see how they made their owl creations will win some fun prizes!! (Picked by Random.org) My friends would love it if you'd follow their blogs, too! Please leave me a comment telling me that you visited my friends' blogs to be added in the drawing! Here's what you could win! I will pick ONE winner on Friday, November 16th. 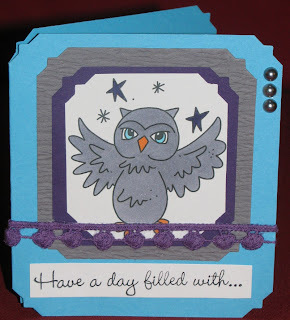 Here are the cute owl projects I want to share with you today! This beautiful card was made by my friend Janet. 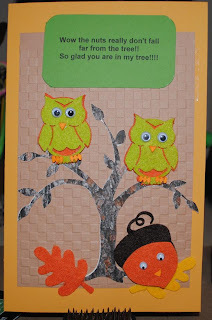 Please click on her name to visit her blog and see how she made this card! LOVE that owl punch!! This adorable card was made by my friend Tess. 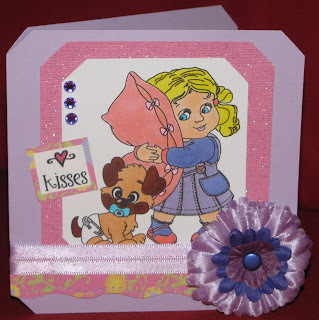 Please visit her blog and see how she made her card! I love the bright colors on this! 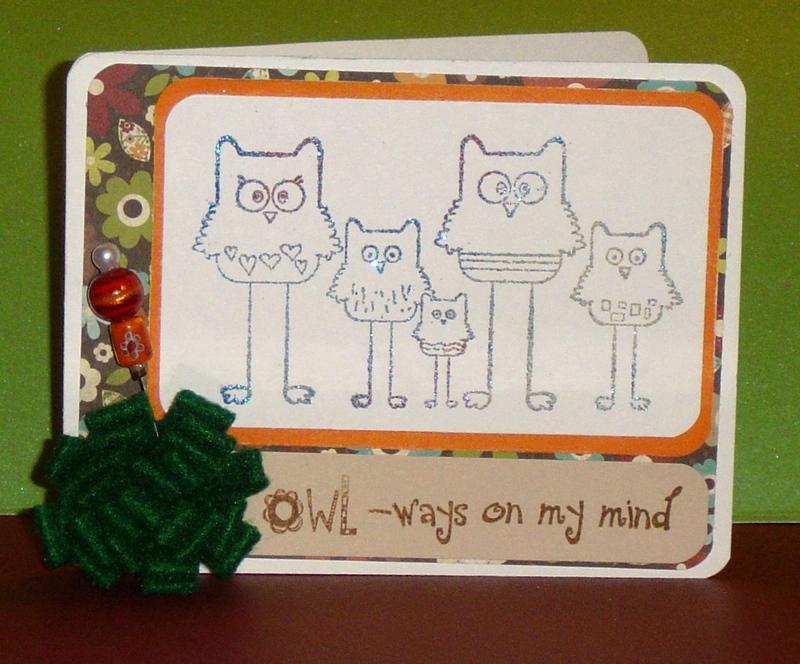 This fun card was made by my friend Shelley. I love the little saying on the front! LOL Please head over and see how she made her card! This sweet owl Christmas card is so stinkin' cute! This was made by my friend Lisa. Please head over to see how she put this together! Love that owl with the hat and scarf!! 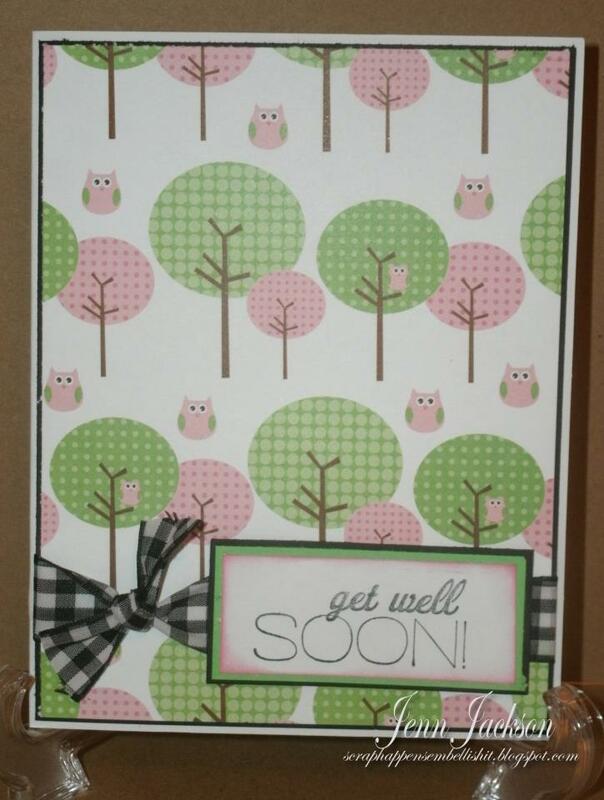 This precious Get Well card was made by my friend Jenn. 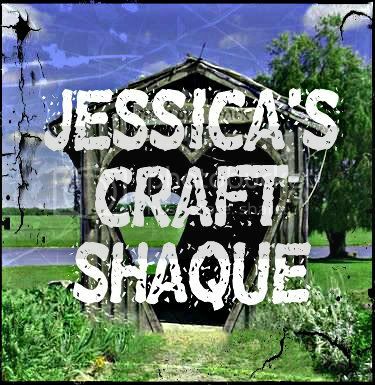 Please click on her name to visit her blog to see what she used to make it! I know if I were sick, this card would make me feel better! more about the embossing technique she used over at her blog, just click on her name! Can you spy the Pinque Peacock goodies she used? My friends and I want to thank you for stopping by today! I hope you enjoyed the sweet owl projects! Good luck to you all! I hope you have a lovely day!! Have a day filled with...fun! Happy Monday, crafty friends! 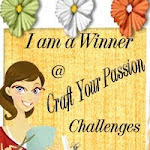 As I mentioned last Monday, I am the November Guest Designer for the Craft Your Passion Challenge Blog! Thanks so much, Jenn, for having me! I am having so much fun! There is a new Challenge each Monday and the new challenge is..
Bugaboo Digital Stamp "Magical Tidbit"
This card came together really fast. I didn't think it needed much with that cute image! Plus the theme is CAS so it worked out! :) Thanks so much for stopping by today! 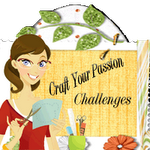 Please be sure to head on over to Craft Your Passion to see all of the wonderful inspiration and join in this fun challenge! Yay!! It's Friday! I am happy about that! How about you? Do you have anything fun planned for the weekend? So, yesterday I made it into the craft room again for a little bit and I finished 2 cards. They are quick and easy ones, but I think they turned out pretty cute. Since I decided to step down from the design team that I was on, I am enjoying crafting just for fun! Here are my cards! I love my Cricut machines but sometimes it's fun to just use punches and not have to deal with cutting mats and such. I hope you like my cards for today! I hope you have a wonderful weekend!! 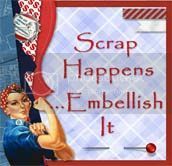 Happy Wednesday to all of my crafty friends! Hope your week is going smoothly! I have another card to share with you today. I made it at the crop I went to on Saturday. I made four cards and a layout that day! That's good for me, I am usually lucky if I get one thing done because I am chatting the whole time. lol I hope you like my little card! Thanks so much for stopping by! If you like my flower with the button center please keep a look out over at the Pinque Peacock blog! Hi all! How's everyone doing today? 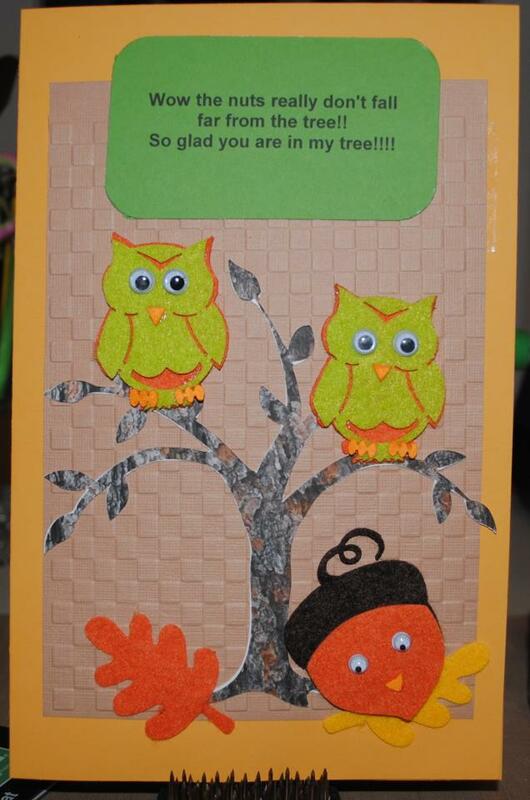 I was able to get in my craft room for a bit this morning and I made a cute little card to share with you. I used one of our Pinque Peacock corsage/stick pins. Here's my card! For this card, I used one snowman punch by Ek Success. I used my cutterbee scissors to cut the top hat and turn it into a stocking cap. Here's what the punch looks like. I cut out 2 snowmen with white glitter cardstock. I cut them out so they faced opposite directions. The sentiment stamp is by CTMH, I used a little punch for the red heart. The ribbon was from my stash and the stick pin is one I made for Pinque Peacock. We will have tons of unique stick pins, flowers, and fabric covered buttons in our store very soon! Here's the blog Pinque Peacock, we'd love to have you become a follower! I hope you like my card for today! Thanks so much for stopping by and leaving me a comment! I will come back and visit you if I know you were here! Have a crafty fun day!